Mystical and enchanting you could call it. But can a slot game ever truly be magical? Magic implies a sense of trickery, but not all trickery is bad. Perhaps Magic Slots, might work its magic to fill your coffers instead of drain them. Yes, that is far more likely. Magic Slots is a three reel, one pay line Online Slot game modelled after its real land-based casino's counterpart, and it truly wouldn't look out of place in either the French Riviera, or Las Vegas to be frank. Designed by Playtech, one of the leading developers in online casino software, Magic Slots is a simple little game, that has a lot of style on its reels. Simplistically, Magic Slots has only one pay line, though stakes can be raised by up to three coins at once. The game accepts bet denominations from 25p up to £5 so you can really try your luck with enhanced wagering. 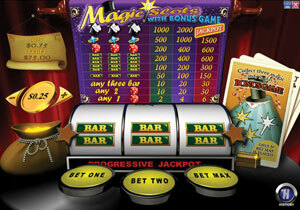 The standard Magic Slots jackpot is often based around £2,000 though the progressive jackpot is considerably larger. Magic Slots accumulates this jackpot by syphoning off a small amount of each bet wagered and adding it to a larger progressive pot, which can be won should a gamer have all three coins activated, and be fortunate enough to land the hat and gloves symbol three times on the selected pay line. Other than that the game uses symbols most frequently found on other standard Slots machines. Namely bars and dice, although they do feature a diamond ring which is odd. Pay-outs vary from 2,4 or 6 coins for having 1 dice, and for playing 1,2 or 3 coins respectively, up to 1,000, 2,000 and Jackpot for having three hat and glove symbols and for playing 1,2 or 3 coins accordingly. An unusual symbol is Magic Slots, Magic Wand symbol. Collect three Magic Wands on your pay line and you will automatically reach the bonus round, providing you again have placed the maximum three coins bet. The bonus game consists of four Magic Hats, and once you have selected one you will be rewarded with your bonus. Of course, the bonus game comes down to luck, and once you have discovered if you either have or haven't got any, you'll be returned back to the Magic Slots game. Fancy a bit of magic in your life? Well Magic Slots may not be the biggest online slot game, but they may still have a trick up their sleeve. At Magic Slots, you never know what you are going to pull out of their hat. Wave your little wand, and who knows what might fall into your lap with Magic Slots today.